The Apple Watch Series 4 is fantastic, there’s no doubt about it. But it’s also very expensive, with prices starting at more than $300 and going up to $1,000 and beyond! 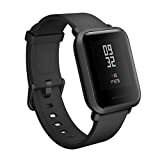 But even at $1,000, there are two important ways that the $80 Amazfit Bip Smartwatch by Huami has the Apple Watch beat. First, it works with Android devices in addition to iPhones. Second, it supports sleep tracking. And third, it lasts for up to a whopping 30 days per charge! You can’t even get two full days of battery life out of an Apple Watch.